On Monday, we introduced and launched our "Change Your Generation" game to continue to grow our global leadership in the industry. This is the very first of its kind generation mix simulation game by any electric utility to help stakeholders, partners, professionals, teachers, students and citizens at large to understand and learn the details of our generation mix challenges as an industry and society. The game is open to anyone in the world. Below is an article posted by KEYETV on their website about our game. The Who aren’t the only ones talking about their generation. 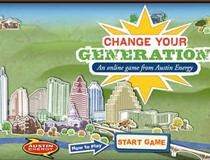 Austin Energy launched its new program “Change Your Generation” which is designed to help educate energy rate payers and get feedback as to what energy resources people want to use in the future. This is not your typical website game – there are no levels, enemies or bonus points. Instead, players are given 100 megawatts of energy to distribute among a variety of energy resources in order to determine what combination will help the community. As participants select options on the screen it shows the consequences or benefits of using or depleting some energy resources such as coal, natural gas, solar power and wind. The goal of the game is to meet the projected electric demand in the Austin area over the next 11 years. The game is part of a public participation process which began in November to survey community preferences on how to power the Austin area in upcoming years.